On Friday, August 18, Netflix will start streaming Marvel’s The Defenders. I have been waiting for this since Marvel and Netflix announced their collaboration in 2013. This iteration of the Defenders is Charlie Cox as Matt Murdock / Daredevil, Krysten Ritter as Jessica Jones, Mike Colter as Luke Cage, and Finn Jones as Danny Rand / Iron Fist. The four heroes will work together to defeat The Hand. The head of the Hand is Sigourney Weaver as Alexandra. Under her control will be Elodie Yung as Elektra Natchios, Matt Murdock’s former lover who died at the end of the second season of Daredevil. Other characters who were in the other four shows will also appear in this miniseries. Let’s look back at the four members of the Defenders. Matt Murdock was the first Defender to have a show. He is a blind attorney who lives in Hell’s Kitchen. IRL Hell’s Kitchen is a nice neighborhood in New York. In the Defenders universe, it is a hellhole because of the Battle of New York. It took place in the Avengers movie. Blinded as a youth from a chemical accident, Matt lost his eyesight, but his other senses heightened. While he was still a boy, a blind man named Stick, (Scott Glenn) became his mentor. Stick is also the leader of the Chaste, a group that fights against the Hand. When the show began him and his law school buddy, Foggy Nelson (Elden Hensen) opened a law firm. They eventually hired one of their first clients, Karen Page (Deborah Ann Woll) to be their secretary. Matt and the Daredevil’s main nemesis in the first season was Wilson Fisk / Kingpin (Vincent D’Onofrio), a developer who wants to improve Hell’s Kitchen, by any means necessary. (Usually through violence) Kingpin turned out to be one of the best villains in the MCU. One of the people Matt met was a nurse, Claire Temple (Rosario Dawson), who will eventually become the link among all four heroes. In the second season, we are introduced to Frank Castle / Punisher (Jon Bernthal) and Elektra. The main culprit is the Hand, the same culprits for the Defenders and Iron Fist. The Hand are the ones who will bring back Elektra and are responsible for the big hole in New York that will be important in the miniseries. At the end of season two, Matt and Foggy’s law firm, Murdock and Nelson goes under, mostly because of Matt, and Karen becomes a newspaper columnist. Foggy joins the law firm of a character we will meet in Jessica Jones. The second Defender to get a show was Jessica Jones. Jessica is a hard drinking private eye who also lives in Hell’s Kitchen. Unlike Matt Murdock, Jessica has powers; she has superhuman strength and limited flight. She tried to be a superhero once, from the encouragement of her adopted sister and best friend Patricia ‘Trish’ Walker (Rachael Taylor), but being a superhero wasn’t her thing. Jessica never had an easy life, losing her family in a car accident as a young girl, and the mysterious chemicals from the accident giving Jessica her powers. One day she ran into Kilgrave (David Tennant), a villain who had mind control powers. He used these powers to put Jessica under his control. He had her do terrible things for him, and he did terrible things to her without her consent. Jessica was eventually able to get away from him but she suffers post-traumatic stress disorder (PTSD) from her experience. An attorney she sometimes works for, Jeri Hogarth (Carrie-Anne Moss) has a client that Kilgrave also controls. Jessica rescues her from the room he is holding her in, but he is still able to have Hope Shlottman (Erin Moriarty) kill her parents. The rest of the season is a cat and mouse contest between the two. Jessica reunites with her estranged sis Trish, and becomes involved with another super powered person, Luke Cage. Jessica is stalking him; her reason will be the cause of their breakup. Along the way, she becomes close to her junkie neighbor Malcolm Ducasse (Eka Darville) who unbeknownst to her also has a connection to Kilgrave. Eventually Jessica overcomes Kilgrave and really becomes free. Luke Cage’s introduction was in Jessica Jones. After their messy breakup, Luke goes from owning a bar to working in a barbershop in Harlem. Luke has a secret, he is an escaped prisoner named Carl Lucas who escaped from Seagate prison in Georgia. While there, he was part of a secret experiment, which gave him superhuman strength and unbreakable skin. Luke is trying to keep a low profile but is dragged into a confrontation with the main crime boss in Harlem, Cornell ‘Cottonmouth’ Stokes (Mahershala Ali), the owner of the Paradise nightclub, and his cousin, city councilwoman, Mariah Dillard (Alfre Woodard). Mariah has visions of rebuilding Harlem, with the ill-gotten gains of her cousin. Once Cottonmouth’s thugs shoot up the barbershop Luke works in, killing its owner, Luke becomes a thorn in the sides of Stokes and Dillard. Another thorn in their side is Detective Misty Knight (Simone Missick) of the NYPD. She and Luke don’t always see eye to eye, but they both want to bring down this crime family. Things become complicated when a new villain enters the picture, Willis ‘Diamondback’ Stryker (Erik LaRay Harvey). Stryker is a gunrunner who makes Stokes seem benevolent. He and Luke have a volatile connection. Luke goes back to prison, but as a community hero. He should be out about the time The Defenders start. Claire Temple who played a prominent part in Daredevil, but played a minor part in Jessica Jones, is prominent again in Luke Cage. She will continue being prominent in Iron Fist. Nayah was not in existence when Daredevil, Jessica Jones, and Luke Cage premiered, but the site did exist when Iron Fist premiered. I wrote a review of the whole season if you are interested. Of the four series, it clearly wasn’t my favorite. Danny Rand returns to Manhattan after being missing for 15 years, presumed to be dead after the plane crashed that he and his parents were on. Some monks rescued Danny and took him to the secret city of K’un-Lun where he learned martial arts, and eventually became the Iron Fist. The Iron Fist is a mystical power he can call upon. He spends large portions of the first season trying to prove he is Danny Rand. Ward (Tom Pelphrey) and Joy (Jessica Stroup) Meachum, his childhood friends who are running his father’s company, Rand Enterprises, don’t believe him, but that changes eventually. Along the way, he becomes friends with Colleen Wing (Jessica Henwick) the owner of a martial arts dojo. He meets Claire Temple through her. Later in the season, his friend from K’un-Lun, Davos (Sacha Dhawan) appears, looking for him. Danny has a run-in with the Hand, and with his father’s old partner, Harold Meachum (David Wenham), Ward and Joy’s dad. Danny also discovers that Colleen and her sensei Bakuto (Ramon Rodriguez) are members of the Hand, the ‘good’ branch. The series ends with Danny and Colleen going to K’un-Lun and finding it missing. 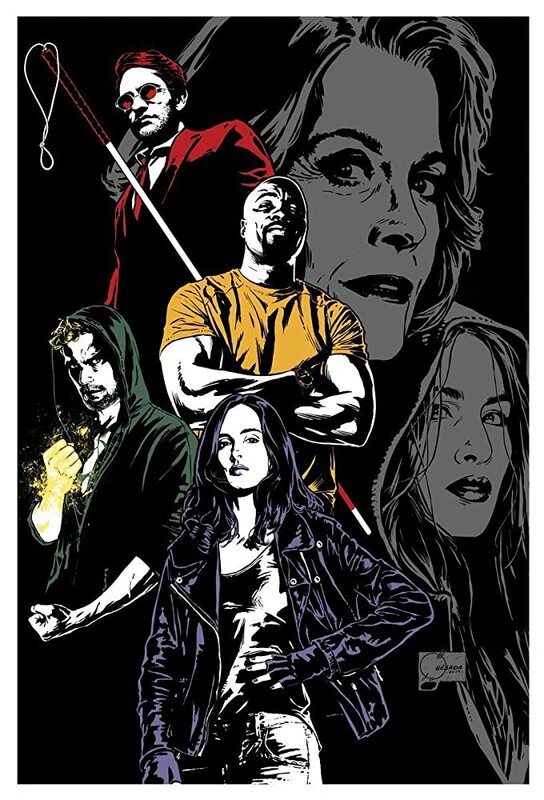 I haven’t seen The Defenders yet, so I don’t know how lost you’ll be if you’ve never watched the four other series before. EW made a study guide for you. ScreenGuide made a video that tells you everything you need to know about The Defenders. I hope this preview also helps. I will be writing recaps for each of the eight episodes. I’ll try to post one every day after Friday. So see you in Hell’s Kitchen.